Melbourne Airport is likely to become the first airport in Australia to let passengers board their flights without having to remove electronic devices or liquids from their carry-on baggage. To pave the way for the breakthrough, the airport is currently trialling new technology created by Smiths Detection, a specialist in threat detection and screening technologies for aviation, ports and borders, urban security and defence markets. Smiths Detection confirmed yesterday it has begun working with airports in Australia to introduce the latest in Checkpoint Computed Tomography (CT) and automated lane technology, starting with the trial at Melbourne Airport. Computed (or computerised) tomography (CT) is similar to the technology behind CT scans (also known as CAT scans) – the medical imaging processes used in hospitals to create pictures of the inside of the body. The new airport technology is the first certified in Australia to meet the European Civil Aviation Conference policy on Explosive Detection System for cabin baggage, Smiths Detection said yesterday. 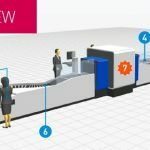 The three prime components of the system are: a hi-tech baggage screening system to provide the highest level of security; an effective automatic tray handling system to move cabin baggage efficiently through the scanner; and checkpoint management software to oversee it all. The company cites an International Air Transport Association (IATA) survey that revealed the two biggest “pain points” for travellers are airport security and the boarding processes. Melbourne Airport chief of aviation Simon Gandy said the airport had gained valuable insights into the operation of the new technology as a result of implementing the trial in collaboration with Smiths Detection. “Thanks to the pilot program we are able to better understand how in the future passengers can pass through security screening without having to divest their items, which simplifies the start of the traveller journey right from the outset. “As Australia’s busiest 24/7 airport we will continue to find ways to implement new technology and upgrades that will improve the traveller experience from the road to the runway,” Gandy said. Managing director of Smiths Detection, Jordan Thrupp, said his company “looked forward to assisting the Australian aviation market in understanding, and using CT technology, particularly as the Australian government works towards enhancing aviation security screening regulations”. Smiths Detection has more than 2300 CT systems and 75,000 X-ray systems in more than 180 countries and over 24,500 explosive trace (ETDs) detectors installed worldwide.